I went to my mother-in-laws house shortly after Christmas and noticed some almonds in a gift wrapped dish. This was one of the neighborhood gifts that had been given to her. Once I tried them, I fell in love. Deeply in love. Addicted. I couldn't stop eating them! One after another, savoring the crunchy cinnamon-vanilla flavors......mmmmm. Just thinking about them made my mouth water and ache for more! Candy is not my forte, but these were very simple and easy to make. I used parchment paper instead of a greased baking sheet, which made clean up very easy. I also made sure I used a heavy-bottomed pan and stirred the mixture constantly, to prevent burning. Put 1 c. sugar in a heavy bottomed saucepan. Add 1 t. vanilla. The good stuff. Not imitation! And cook for 10 minutes or until it reaches crystallize stage. Hmmm....it's hard to see through the steam. It's starting to crystallize on the sides. Maybe it's ready. Boil, boil, boil. Stir, stir, stir. Aaaack! It began to crystallize VERY quickly! It says to 'spread' the almonds on a greased cookie sheet. I used parchment paper. Put them in a 300 degree oven for 10 minutes. Mix (more like chop them apart) and bake for 5 more minutes. Here they are....in all their glory. It's best to let them cool. Mix and bring to a boil the water, sugar, cinnamon and vanilla. Mix in the nuts and boil for approximately 10 minutes or until mixture reaches crystallize stage. Bake 10 minutes at 300°. Mix and bake 5 more minutes. 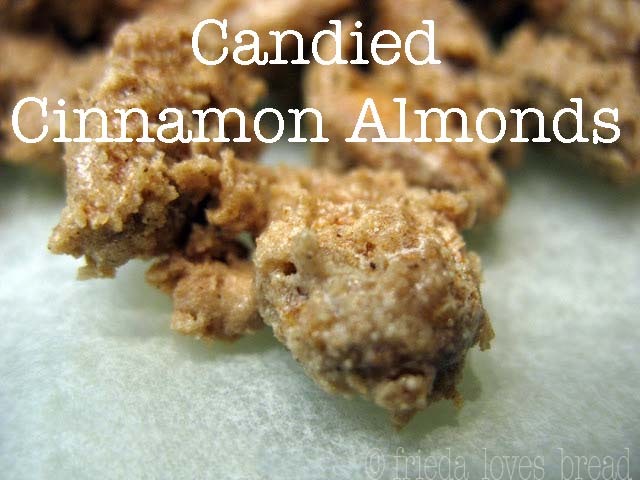 I made a candied pecans this past Thanksgiving. You are right, they are addictive! Thank you for accepting my friend request on Foodbuzz. I can't wait to read future posts! Oh, I love these! I had no idea how to make them myself though! Thanks for visiting my blog and for the great recipes! Oh my goodness! I LOOOOVE these! I crave these! they look great! I'll definitely be playing around with this, thanks frieda!